Which Five Tech Inventions Were Designed By Malaysians? Intel’s Malaysia Design Center (MDC) is celebrating its 25th Anniversary this year. That’s 25 years of Malaysian ingenuity contributing to the advancement of modern technology. To celebrate event, the company has released an infographic about five technologies that were conceived right here in our country. Malaysia is not usually associated with life changing technologies, but we’ve had a much bigger effect on the world than we would think. Especially since it turns out that the MDC was responsible for creating the most common micro-controller in the world with the USB 1.0. 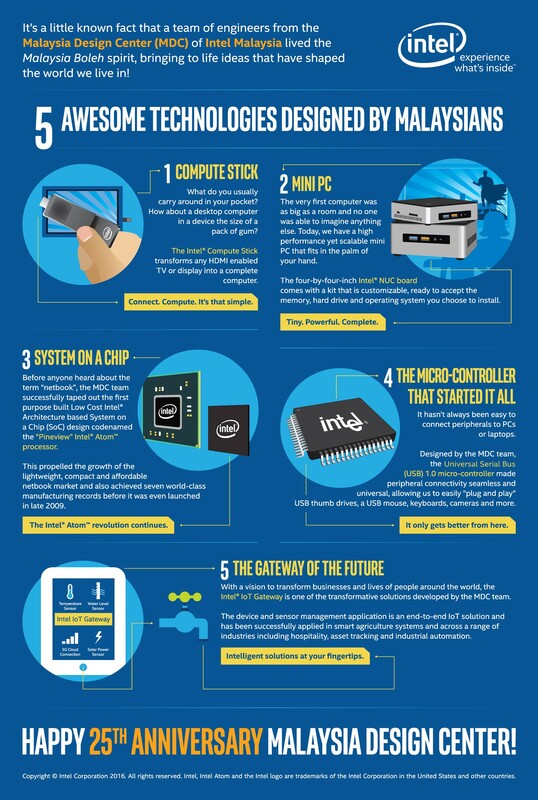 Aside from that, Intel Malaysia has been very open about the fact that the Intel Compute Stick was completely developed and designed in the country. It was a Malaysian engineer who came up with the idea for the device, and it was a Malaysian team to get it to market. Twenty-five years is a long time for Intel to be tapping Malaysian talent, and with any luck that steady stream of local contributions won’t dry up any time soon.